There is a craze sweeping the sports world where athletes want to wear a championship belt to flaunt their accomplishments. What was once something designated only for the best of the wrestling and boxing world now has extended to the other major sports. I appreciate the creativity of LeSean McCoy and LeBron James for finding a way to get their hands on a championship belt and show the world, but like Rene said to Brodie in Mallrats said, “that was too little too late.” They weren’t the first to do so so they do lose some originality points. Here’s a look at some of the best uses of a championship belt as a prop that happened before Shady and Bron Bron did it. That’s right, we are starting in our own backyard. I won my fantasy football championship in 2012 and our league trophy is a championship belt. Since the Seattle defense put up insane numbers in the fantasy playoffs to lead me to victory I’ve been rocking this belt everywhere. I did everything in my power to wear that belt as many public places as possible, as evident in the Bacon, Sports & Beer Celebration video. I most certainly used it as a marketing ploy to help add some extra flavor to how we roll and who we are. Championship belts are badass and people will notice you. Because championship belts are so badass they break the normal human barrier that exists for talking to strangers and people will come up and ask you what it’s all about. It’s like the championship belt has some sort of magical power. When I tell them that I’m rocking the belt because I won my fantasy football league I get extra dap points for being so awesome. That’s how it’s done. nWo 4-Life!! The heel turn of Hulk Hogan is the most epic in the history of sports. Despite not having watched wrestling in 10+ years it’ll still go down as one of the most memorable moments of my life (really, it was un-freaking-believable when it happened). Hollywood Hogan was a larger than life character and he fully embraced his entrance music, Jimi Hendrix, and being Hollywood. Bravo Hulkster, show em how it’s done! “The Million Dollar Man” Ted DiBiase is one of the greatest WWF characters of all time. What 8-year old wouldn’t want to look up to a successful, well spoken and confident businessman/wrestler who has so much money that he had a belt made of diamonds that cost a million dollars? On top of that he had his own ring valet in Virgil. You can now add mentor to his list of positive attributes. How inspiring. His million dollar belt was the equivalent to 10 hoverboards from Back to the Future 2 in badassness. Your mind was blown. This is how you do a belt. Belt don’t lie. The one who got the championship belt craze started for professional athletes. Rasheed Wallace was never on a team that I rooted for but I always loved him. What isn’t there to love? He got some of the best technical fouls, was a pretty good baller when he wanted to be, and gave us one of the best catch phrases in “ball don’t lie”. Winner winner chicken dinner. Woh. Who knew that championship belt collecting was a thing? Boy would it be fun to get drunk at this guys house and play a game of “what can you do on camera with a championship belt.” I’d do about a thousand Ric Flair “Wooo’s”, a couple people’s elbow’s on the belt, and maybe even a Double J Jeff Jarrett, J-E-Double F J-A-Double R-E-Double T strut. I know it happened after LeBron/McCoy but it was too good to pass up on. 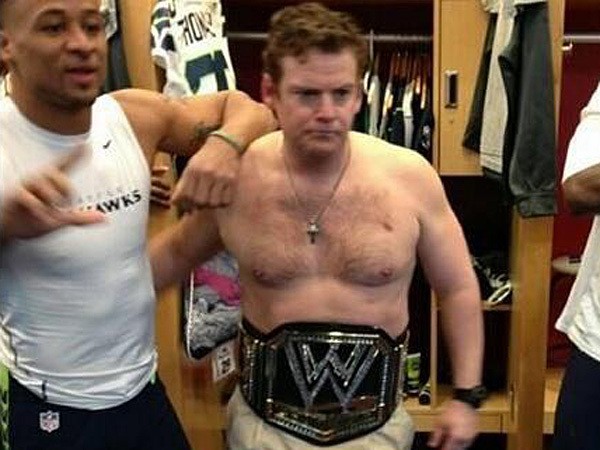 When you win the Super Bowl in devastating fashion and you are the GM of the team that wins then you have the power to take your shirt off and rock a WWE championship belt like a boss. Hate all you want, you win the Super Bowl and you are the brains behind it you and are going to be going nuts.